In 1987 a rock panel with engravings and cup marks from the Early Bronze Age was found on the outskirts of the town of Kongsberg in Norway. Among the engravings was discovered a Cretan-Minoan inscription, consisting of five Linear A letters or syllables. Nothing like this has ever been found outside the Aegean region. But, there is an obvious explanation for the existence of this inscription in Kongsberg – as the Kongsberg area holds the world’s biggest occurrences of native silver, the most precious metal of the Early Bronze Age. It is the quest for silver that has brought the Minoans to Kongsberg when silver was twice as valuable as gold in Egypt. This region once held vast deposits of native silver, evidenced by thousands of small silver mines, along with big ones, scattered over an enormous area, covering forests and mountains surrounding the town. 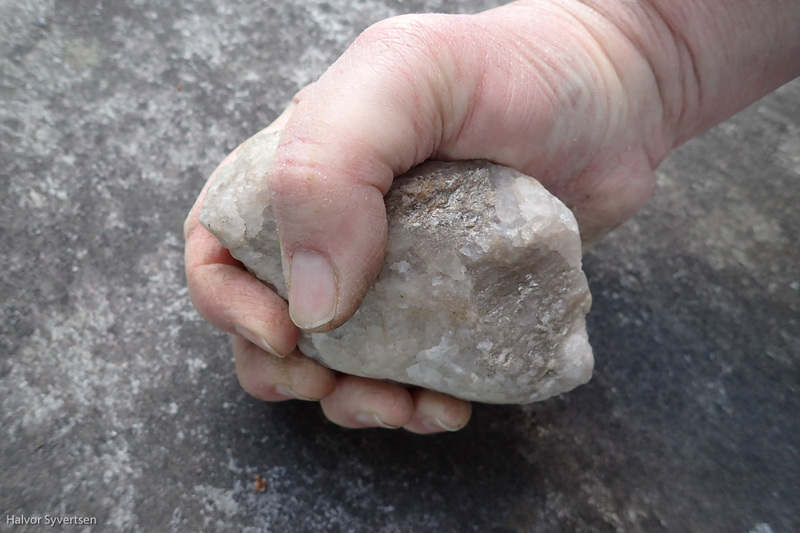 Conspicuous wire silver could be easily pecked out at the very surface of the rocks at Kongsberg, with primitive tools. The Linear A signs beneath were photocopied from «Inscribed Tablets and Pithos of Linear A System from Zakro», by N. Platonos and W. Brice (1975). The cup form of the pi sign is characteristic also of the pi sign pecked into the rock, but this copy is from the Norwegian semitist, Ph.D. Kjell Aartun’s list in Die Minoische Schrift. Band I (1992). The rock panel, with pictures of carvings, is described under chapter Kongsberg. Dr. Aartun’s decipherment of the Linear A inscription is rendered at the end of this article: The reading of the Linear A inscription at Kongsberg, and in the Appendix are rendered some Linear A translations by Dr. Aartun. There is clear evidence that surface mining of native silver has been exploited at Kongsberg since the Early Bronze Age, and perhaps even before (see pictures and texts below). In 2005 two professors of archaeology, Kristian Kristiansen, University of Gothenburg, and Thomas B. Larsson, University of Umeå in Sweden, stated that there must have been a direct contact between Scandinavia and the Minoan/ Mycenaean civilization in the Early Bronze Age. They write: “However, foreign origins were most consciously demonstrated in the formation of the Nordic Bronze Age Culture from 1500 BC onwards, basing itself on a Minoan/Mycenaean template.” (Kristian Kristiansen and Thomas B. Larsson, The Rise of Bronze Age Society, Cambridge University Press, 2005.) See full reference further below. The Minoan Linear A-inscription discovered at Kongsberg is the theory’s missing link, and confirms their statement. The authors were unaware of the Kongsberg-inscription when the book was published. It has recently been proven by isotope analyses that copper/bronze objects in Sweden were imported in the Early Bronze Age from Spain and Sardinia (Johan Ling, 2014), regions known to the Minoans. – The Bronze Age in Norway is the most enigmatic of the cultural epochs in Antiquity. Of bronzes imported in Norway in the earliest Bronze Age, we have, among many imported items, forms which have their origin in Italy, in Central Europe and also in Britain – (professor Haakon Shetelig, Norges Forhistorie, 1925, pp 73, 82, transl. ‘Prehistory of Norway’). The five characters, although very eroded, have some resemblance to archaic Greek letters of the 8th century BC, representing sigma, delta, tau and goppa, lambda, but are nevertheless different from them. This enigmatic inscription, tentatively “identified” as archaic looking Greek consonants and therefore meaningless, was published in the local historical review of “Langs Lågen” in 1988. The Linear A inscription viewed from different angles. The characters are not made with a hard metal chisel, but were carved into the rock, probably with a stone tool, which explains the pecked marks and uneven groove of the signs. This is evidence that the inscription, which is very eroded, was made before iron tools came into existence. Only the extremely rich occurrences of native silver in the Kongsberg area could have brought the Minoans, the great metal traders of the Mediterranean in the Early Bronze Age, to Norway and this particular site more than 3500 years ago. Nothing could have prevented the Minoans from coming to this remote area at a time when silver was twice as costly as gold in Egypt (before 1500 BC) and there existed connections between Norway and the continent. The find of a Minoan inscription at Kongsberg presupposes mining of silver there more than 3500 years ago. It remained to be proven. Only in 2015 a direct evidence was found (in June), a quartzite hammer stone in situ, inside a small, unknown, primitive silver mine and thus a mining tool, proves that silver mining took place at Kongsberg in the Early Bronze Age, along with a discovery (in April) in an old silver mine of rock engravings akin to rock paintings in Southern Europe from the Early Bronze Age or Neolithicum (pictures below). In 2015 an archaeological excavation carried out on the vast field at the foot of the hill with the Minoan inscription, and only 1,5 km distant, disclosed charcoal from cultivation in the ground, C 14-dated to a period between 1700 and 1900 BC, exactly the same period as the dating of the Linear A-inscription, which proves that people have lived on and cultivated this field by the river flowing through the town in the Early Bronze Age. The entrance to the Bronze Age mine with quartzite hammerstones in situ. 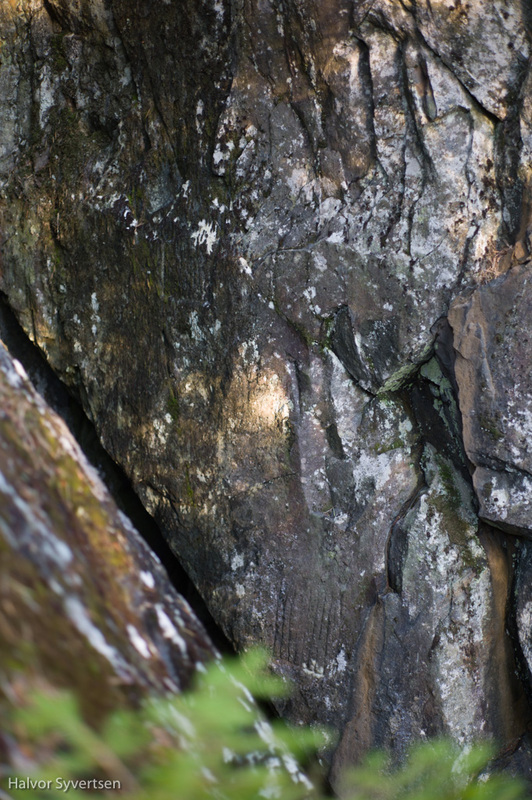 Two rock engravings discovered (in April 2015) over the shaft in the entrance to an old silver mine in Kongsberg, not far from the primitive mine with hammerstones. The grill pattern engraving is identical to painted grill (grid) patterns found in Val/Valle Pellice in Italy (at the French border) and in Spain, in Cueva del Silex/Galeria del Silex, with a big flint mine, and in Cueva de Herrerías, which date from Late Neolithic or Early Bronze Age. Primary sources, the accounts of the Kongsberg Silver Mines, prove that this mine is older than the Kongsberg Silver Mines, who reopened the mine 300 years ago. The first description of Crete and the island’s population and culture is presented to us through the works of the Greek poet Homer, who in the 8th century BC wrote the Iliad and the Odyssey. Homer has handed down to us the legend of King Minos, the wise ruler who governed a mighty seaborne empire from Crete, and the story of his son, the Minotaur and the Labyrinth, which Arthur Evans identified as the Palace of Knossos. Old Egyptian sources speak of ”Keftiu”, in Akkadian (Assyrian-Babylonian) called “Kaptaru”, i.e. “Land beyond the Sea”, obviously meaning Crete. Homer mentions five different speaking peoples living on the island, Achaeans, Kydonians, Dorians, Pelasgians and Eteocretans, that is, “the true Cretans”. Thus “Eteocretans” was the name the Greeks employed for the original inhabitants of Crete. Minoan Crete was conquered by the Mycenaean Greeks about 1450 BC. The splendid Minoan civilization had vanished so completely that its existence was only brought to light again by the archaeological excavations conducted by Arthur Evans (1851 – 1941) from 1900 onward. Excavating at Knossos, Evans found 3000 clay tablets with an unknown script. Evans named the script Linear A and a younger modified form of the same script he called Linear B. Since the script was unknown, and consequently the language it covered, it was not known what the people, who had created the script and culture, called themselves. Therefore Evans dubbed them “Minoans” and their civilization “Minoan”, after the legendary ruler of Bronze Age Crete, King Minos. Evans never succeeded in deciphering the script, but he was of the opinion that the language was not Greek. But in 1952 the young British architect Michael Ventris (1922 – 1956) was able to identify the language behind the Linear B tablets as Greek, although in a rather archaic form. However, it became clear that the language written on the Linear A tablets was not Greek, since it was incomprehensible even if there was reason to believe that the phonetic values of the Linear B signs, or syllables, were the same as the identical syllables of Linear A. Obviously the Greek conquerors of the Minoan empire had adapted the script of the superior Minoan culture, with some modifications, to their own language (Linear B). The Minoans themselves, who had not fled Crete, took abode on the hilltops in the rugged interior of the island, where the culture and Minoan language of these Eteocretans survived for some time in the small communities they established under, or far from, Greek (Mycenaean) rule. The American professor Cyrus H. Gordon, who had been studying Linear A tablets since 1956, arrived at the conclusion in 1962 that the Minoan language was Northwest Semitic, belonging to the same language group as Ugaritic, Phoenician and Hebrew. He succeeded in reading parts of some texts, with the support of two short Eteocretan (the old Minoan language) and Greek bilingual texts. However, he was not able to break the code completely as he did not recognize that the Minoan language, although pertaining to West Semitic, belongs to the Southwest Semitic group, the same language group as modern Arabic, as discovered by the Norwegian semitist, Dr Kjell Aartun. Dr Gordon thinks that the Minoans once came over to Crete from the Nile Delta (Cyrus H. Gordon, Forgotten Scripts, 1971). This means that there is a possibility that they before the Bronze Age came up from the shores of the Red Sea. During the second half of the 1980-ies, Kjell Aartun, who had been engaged in the study of Old Semitic languages and culture for more than 40 years, was able, due to his vast knowledge of these languages, to identify some words on the Minoan Disc from Phaistos (ca. 1600 BC), written in a hieroglyphic script, which gave a clue to the decipherment of the whole disc. With the phonetic values of the hieroglyphs identified on one side of the disc, the correctness of the decipherment can be proven by applying the phonetic values to the hieroglyphs on the other side. If a readable and understandable text in the same language and grammatical system, consistent with the content of the text on the other side, then appears, the reading of the disc must be correct. The deciphered words belong to an old South Semitic language. The iconography of the hieroglyphs, the content and style of the text, fitted perfectly into the framework of old Semitic tradition and fertility religion. Dr. Aartun gives ample evidence in Die Minoische Schrift. Band I that the Minoan culture is predominantly Semitic. Applying this discovery to the Linear A script, based on the phonetic values of the deciphered syllables of Linear B, he was able to read the Linear A tablets. Thus, through his decipherment of the tablets, the forgotten Minoan language was identified as a South Semitic language, spoken in the South-Western part of Arabia (Yemen) in the Early Bronze Age. Those interested in Dr. Aartun’s method of decipherment and his readings of all Minoan written evidence discovered and published until then, in Linear A and in the hieroglyphic script, should consult his treatises published by Harrassowitz Verlag, Wiesbaden, Die Minoische Schrift. Sprache und Texte. Band I (1992), and Band II (1997). The printing was supported by the Norwegian Research Council for Science and the Humanities, and the Norwegian Academy of Science and Letters. The first volume contains his method of deciphering the phonetic values of the Minoan hieroglyphs and his translation of the Phaistos Disc and other hieroglyphic inscriptions, and the second volume his translations of all the Linear A tablets and inscriptions. The languages of the disc and of the Linear A tablets proved to be Semitic, and he also establishes a grammar of the Minoan languages, which are structurally South Semitic languages. In Book 12 Pliny describes the land of the Minaeans as neighbouring the kingdom of the Sabaeans in Yemen, a mountainous country with few springs, full of nitre: “… et Minaei, pagus alius, per quos evehitur uno tramite angusto, hi primi commercium turis fecere maximeque exercent, a quibus et Minaeum dictum est.” (… There is another tract, by itself confronting this country, inhabited by the Minaeans, another people, and through them there is a narrow passage, by which the merchandise frankincense, which is called Minaeum, is transported to other parts). Carmei is in all probability the old capital of the Minaeans, Karna, or Quarna in north west Yemen. The Minaeans were in close contact with the Ethiopians on the west bank of the Red Sea. In the history of Yemen, the Minaean kingdom appears as the first dominating civilization there, around 1200 BC, a kingdom in decline after 1000 BC, that was finally subdued by the Sabaeans around 750 BC. The earliest Greek accounts of the Minaeans on the Red Sea are from the 3rd century BC, by Eratosthenes. The Minaeans themselves claimed that they descended from King Minos of Crete. This may mean that Minos was not a real ruler of Crete, but that the Minaeans themselves had created a myth of “King Minos” being their legendary ancestor, derived from their name as a nation. Probably Evans did not know about the reference to the Minaeans in Pliny’s Naturalis Historia, or else he might have called the old civilization of Crete “Minaean” and not “Minoan”. The Minaeans spoke an old South Semitic language, that is, the same language as Dr. Aartun discovered behind the Linear A script on the tablets he deciphered, and on the Phaistos Disc. Dr. Aartun was able to establish that the Minoan vocabulary and the respective morphology and grammar belong to the South Semitic language group to which modern Arabic and certain Ethiopian languages pertain. Thus it was possible to read the texts. Characteristic for the Minoan languages is the i-ending, which is also very characteristic for the Ethiopian languages belonging to the South Semitic group. This ending was also very common in old South Arabic. In addition, the Linear A-language also reveals certain secondary phonetic developments akin to the phonetic development that early took place in Akkadian, which belongs to the East Semitic language group. Minoans, uttering a saying in their own language, rendered in Egyptian script, depicted in the London Medical Papyrus from about 1600 BC, give us a clue to the nature of their language, as it can be deciphered from Egyptian. It is the same Semitic language as Dr. Aartun deciphered on the Linear A tablets. In 1987 there was discovered, quite unexpectedly, in Kongsberg, 80 kms due west of Oslo, carvings on a horizontal rock panel on the outskirts of the small town. Numerous cup marks among the carvings indicate that the oldest carvings may have been made in the Early Bronze Age (in Norway between 1800 BC and 1000 BC) or even in the later part of the Late Stone Age (Neolithic). 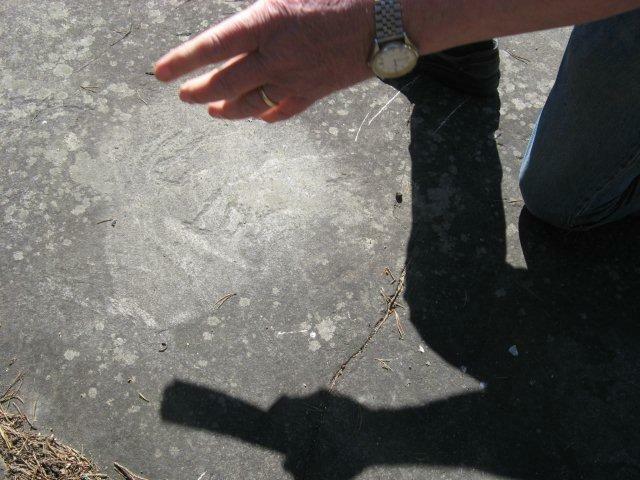 The rock carvings with cup marks, dating as far back as probably Late Neolithic, have been recognized by the Directorate for Cultural Heritage in Norway (Riksantikvaren). A list of the Linear A signs or syllables shows that they respectively matches the Linear A signs we tu yu and pi ti, although the tu-character is less distinct, as it is the most difficult to peck into hard rock. No other script matches them that completely. Thus they constitute two words, wetuyu piti, which prove to be readable when applied to them the Minoan language which Dr. Aartun has deciphered on clay tablets from Crete, inscribed with Linear A signs. Since modern Arabic is derived from old South Semitic, it is possible to read and understand the two words, as they are recognizable in modern Arabic. This cannot be coincidental, and even more so, since the two words are compatible and can be understood as a cult inscription in terms of their localisation. Dr. Aartun interpreted the strange figure as a ligature of two hieroglyphs on the Phaistos Disc, which he had interpreted as the wine sack and the coral, with the phonetic values “u-ya”. The Minoan word “u’ya” in fact had been rendered by Dr. Aartun in Die Minoische Schrift. Sprache und Texte. Band I, in 1992, with the translation “guesting place”. The figure on the rock panel (see chapter 5 «Kongsberg»), surrounded by cup marks from the Early Bronze Age, could then be read and interpreted as meaning «guesting place». Since the rock panel is a sacred cult place, could it mean guesting place of the gods? This find, with pictures of the characters and hieroglyphs and Dr Aartun’s reading of the inscription, has been described in a book published in 1999 (Johan Jarnæs, “Før Kongsberg ble til”, Kronos Media). (“Before there was Kongsberg”, see chapter 3, «Bøker».) The book is written in Norwegian, but the pictures speak for themselves. Two stone settings nearby seem to have lunar and solar calendar functions. How, then, can the existence of a Minoan inscription at Kongsberg in far away Norway be explained? What may have attracted them to this place? The explanation may be that at Kongsberg (a name which means “the king’s mines”) were huge occurrences of silver, in fact the richest deposits of native and wire silver in Europe, perhaps in the whole world. The rock panel with the carvings is, as a matter of fact, surrounded by small silver mines which are situated only some hundred metres away. 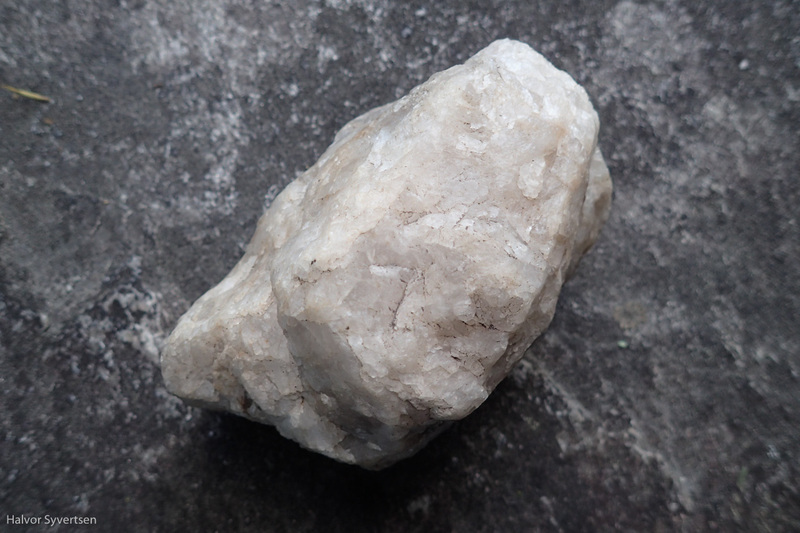 The native silver was found in veins at the very surface of the rock at Kongsberg, and could easily be pecked out in big nuggets, even with stone instruments, in opencast pits. 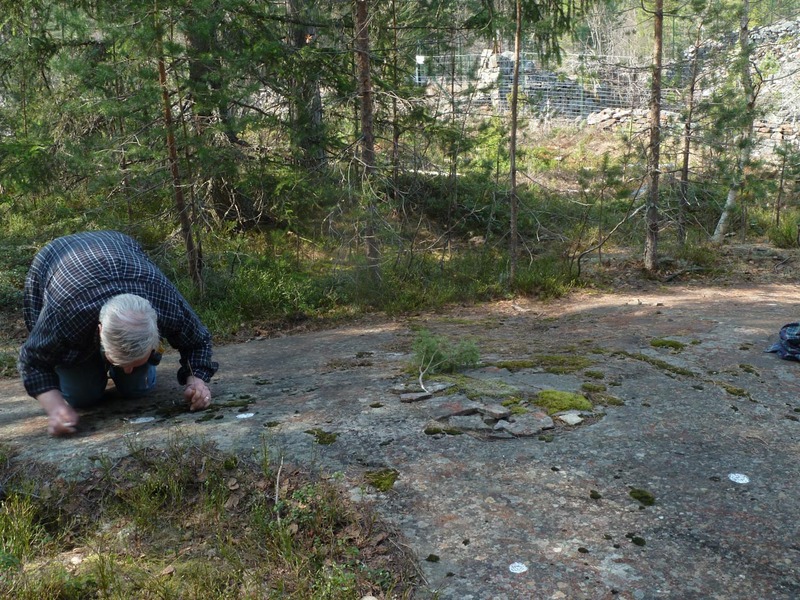 In October 2010 there was discovered some cupmarks and pecking on a rock panel, probably form the Bronze Age, between two of the biggest silver mines of Kongsberg Silverworks, and only 20 metres from one of them. The closeness of the rock carvings to the mines in this barren area can only be understood in terms of a connection with silver mining, in the Iron or Bronze Age. The rock panel with engravings and cup marks (chalked), near the big silver mine to the right. The silver mines at Kongsberg were exploited in the Middle Ages, and more extensively from 1623 to 1957, reaching depths of several hundred, even more than a thousand, metres. 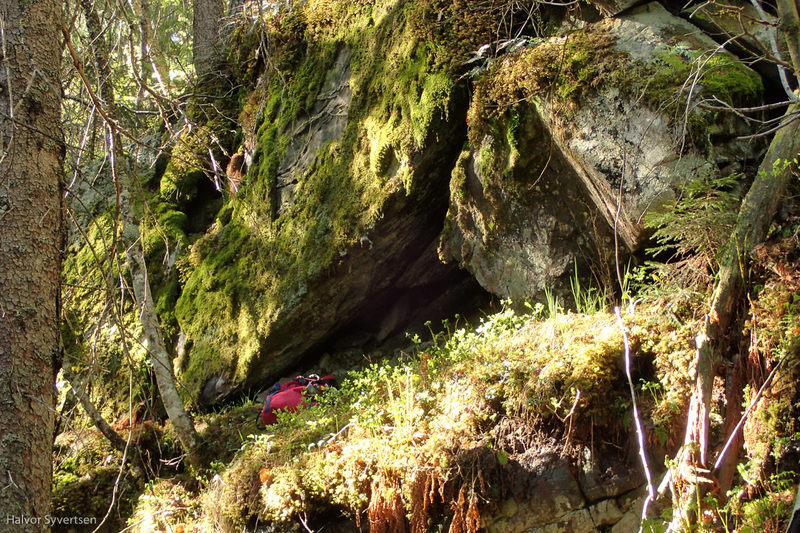 The silver deposits were spread over an enormous area, and traces of very old, even prehistoric mining activity, as it seems, are to be found “everywhere” in the forests and mountains surrounding Kongsberg. Some of these primitive mines have been backfilled in a manner that resembles backfilling of Bronze Age mines in South-Eastern Europe (also described in the book “Før Kongsberg ble til”). These mines at Kongsberg have not yet been archaeologically examined. More than 3500 years ago, there existed a network of mines all over Europe, from the Balkans to Ireland. In the Early Bronze Age copper mines of Mitterberg in Austria, crushed waste material from the separation of the ore outside the mine was transported back into the mine. The Egyptian Tôd treasure in Musée du Louvre, from about 1900 BC, consisting of silver cups, chains and ingots, is probably of Minoan origin. Five rings are most likely made from native silver, which is very rare. Does it come from Anatolia, or perhaps from Kongsberg? The Minoans were the great metal traders of the Mediterranean, as early as 2000 BC. This fact may explain the richness of the Minoan civilization. Before 1500 BC silver was twice as valuable as gold in Egypt and the Minoans maintained close commercial relationship with Egypt. Amber from the shores of the Baltic reached Mycenae and Egypt more than 3500 years ago. The Minoans built seaworthy ships with keels, which enabled them to sail all over the Mediterranean. A wall painting excavated in the Minoan town of Akrotiri on Thera, destroyed by a volcanic eruption in 1628 BC, shows a flotilla of boats in the harbour. The ships seem to be about 30 meters long, at least, and they may not have been technically inferior to the Viking ships, which sailed from Norway to Palestine, Greenland and North America. The two professors of archaeology, Kristian Kristiansen and Thomas B. Larsson, argue in their book “The Rise of Bronze Age Society”, based on a vast amount of evidence, that the rich and spectacular Early Bronze Age of Denmark and Scandinavia can only be explained in terms of a contact between the Minoan-Mycenaean civilization and Scandinavia. They write (pp. 235-236): “Mycenaean traders settled in western Mediterranean and established direct trading connections with southern Germany, and thus linked up with the network that reached Jutland and the amber producing areas. Recent archaeological discoveries have completely changed our perception of Mycenaean presence in this part of Europe”. And “a genuine Mycenaean find appeared in a Middle Bronze Age fortified settlement in Bavaria: a gold diadem made of gold foil of the type found in the shaft graves at Mycenae, together with some raw amber. The authors also point to the fact that a sign or symbol akin to the Hittite hieroglyph meaning “divine” is among the rock carvings at Fossum in Sweden, associated with images of what could be representations of divinities (p. 342). Kongsberg could easily be reached from the sea by boats sailing up the Oslo Fjord and Drammen Fjord to Vestfossen. All the way along this route, from Drammen to Vestfossen and Kongsberg, there are big mining areas of other ores, like copper and silver bearing galena (lead), leading on to the Kongsberg mining area. Minoans, having reached Kongsberg, most likely around 1800 – 1500 BC, at the heyday of Minoan civilization, when silver could be traded for its double weight in gold in Egypt, and leaving a message on a cult place there, would probably have thanked the gods for what ever riches they had come for. The only reason for their coming to Kongsberg would have been the area’s richness in easily accessible native silver. 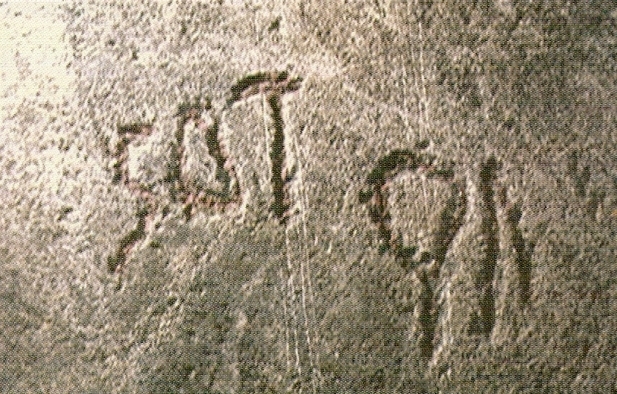 The inscription on the rock face, “wetuyu piti”, identified, read, translated and commented upon by Dr. Aartun, corresponds, according to the phonetic development as clarified by Dr. Aartun, to modern Arabic “watiy-un / wati’-un” (wetuyu < *watuyu) from the Semitic root WTY // WT), meaning “soft, malleable”, and “baht” (piti < *bihti) from the Semitic root BHT, meaning “unmixed, free from admixture, pure”. The i-ending occurs only sporadically in classic Arabic, although it was obviously very common in Old South Arabic, but is a hallmark of the Ethiopian languages belonging to the South Semitic group. Thus the two Minoan words «wetuyu piti» can be interpreted as a cult inscription meaning «(the) soft/malleable (and) pure/free from admixture», probably alluding to the silver in the area, as evidenced by the surrounding mines, and left there in thankfulness to the gods and as a pray for finding more. Native wire silver is soft, malleable, unmixed and free from admixture, or pure. Translation: ”Devout yourself to the true friend who returns to you the good, who is free from hostile thoughts” (lit. “clean from hate”). A Linear A inscription on a fragment of a double axe, used for cultic purpose and placed on Minoan altars, is rendered in Maurice Pope, Cretan Axe-Heads with Linear A Inscriptions, Annual of the British School of Athens, 1956, Vol 51, p.132. The Linear A syllables are: «se da ma te». According to Dr. Aartun (in a personal communication), Minoan «sedamate» corresponds to modern Arabic «Ša dammati», which means «smeared»/»anointed». In the Bible, Exodus 30, 26-30, is described how the altar and its utensils are sanctified by anointing. Professor R.L. Palmer renders a Linear A-inscription, a-sa-sa-ra, repeated on four votive objects (Transactions of the Philological Society, 1958, pp 75-100), which he thinks may represent a title of a goddess. On my request, Dr. Aartun, in a personal communication, has given the following translation, without knowing about the context: The Linear A-syllables represent two words: “a-sa”, modern Arabic asa, and “sa-ra”, modern Arabic sarra. The frase: “asa sarra” means literally: “He gave/offered the one who delights/ who secretly does well.” Being a votive inscription, the translation should be: “He offered this (gift) to the one who secretly does well”, i.e. the divine being. The Greek word for gold, chrysos, is a Semitic loan word that appears in Greek as early as Linear B (Chadwick, 1973). Apparently, the Mycenaean Greeks got their word for gold from the Minoan language. Read the prehistoric writing of the World! Fascinating. The Wiki on Linear A says it is not deciphered yet. But these translations seem to fit the context. Fascinerende. Wiki på Linear A sier det ikke er påvist ennå. Men disse oversettelsene synes å passe sammenheng.